Have you ever found such a stunning piece of wood that you were almost afraid to cut into it? You know the boards I’m talking about. The tiger maple with such unbelievable striping you just want to put a frame around it and hang it on the wall. Or the curly cherry with the surface that looks so deep you could drown in it. It’s not too common to luck into boards like these. So when we do, our first instinct is often to try to showcase that unbelievable figure on every surface of a project that we can. However, this approach frequently leads to less than stellar results that can range in appearance from “meh” to “blech”. If the form itself is lacking, the best wood in the world will not make up for it. Similar results can occur from the over use of other decorative elements, like moldings, carvings, inlay, decorative painting, or contrasting wood species. Any element who’s main purpose is to highlight can also serve to detract if over used, or if the underlying form is lacking. 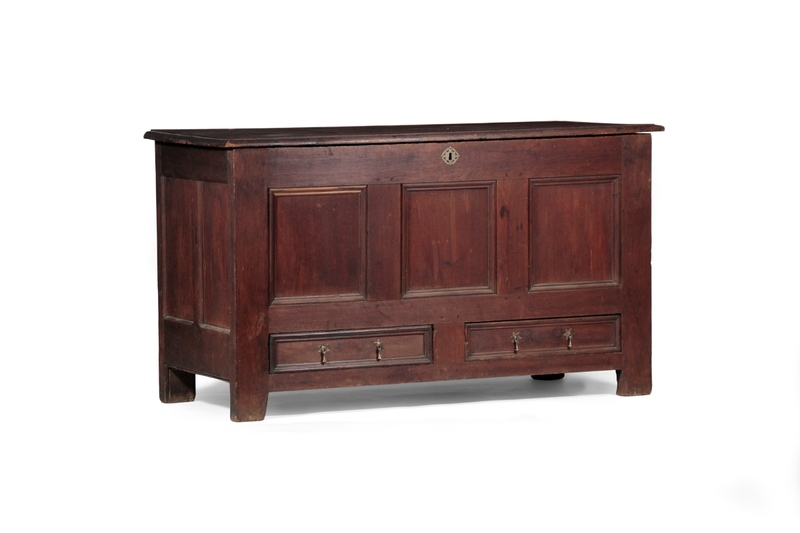 Even though this chest was built with fairly straight grained, “boring” wood, the overall form is very well proportioned and executed to my eye, making it much more appealing than something with wildly figured grain that has been over used, or used in a poorly proportioned piece. Photo courtesy of H.L. Chalfant Antiques. We should even include joinery in this discussion. Woodworkers today are obsessed with showy joinery. Air tight dovetails, pillowed through mortise and tenon joints, and ebony pegs, when used with restraint, can indeed add an element of visual interest to a piece with good underlying form. But if the overall proportions and basic structure of the piece are lacking, it really doesn’t matter how perfect your hand cut dovetails are. Flawless skin cannot make up for poor bone structure. On the other hand, if the underlying form is good, you can get away with a less than perfect complexion. Just look at the furniture on display in most museums. It can be riddled with over sawn dovetails, surface tear out, inconsistent turnings, and be made with boring, figureless wood. But the piece can still be exemplary because its basic form is well executed, and its decorative elements serve to highlight the piece and draw your eye rather than clutter it and create a chaotic appearance. So what’s a woodworker to do? How do we use the wood in that wonderful board in a way that won’t result in utter disappointment? The answer is to start with the basic form and then highlight sparingly. Forget about the figure in the board. Look past the surface. Instead, perfect the underlying skeleton before turning your focus to the skin. Once the overall form and functionality of the piece are worked out, only then should the ornamentation (including the figure of the parts) be considered. Thinking about your designs in this way will increase the likelihood that the figure in the wood will enhance the overall appearance of the piece rather than clutter it. Posted in Design, Random Thoughts, Wood and tagged figured wood. The photo of the chest was graciously provided by HL Chalfant Antiques. It is listed as 53.5″ W x 31″ H x 22.5″ D. You can find more information about it on their web site in the furniture section under chests.